A new addition for the Dymola 2018 FD01 release was the Vehicle Demos library from Claytex. 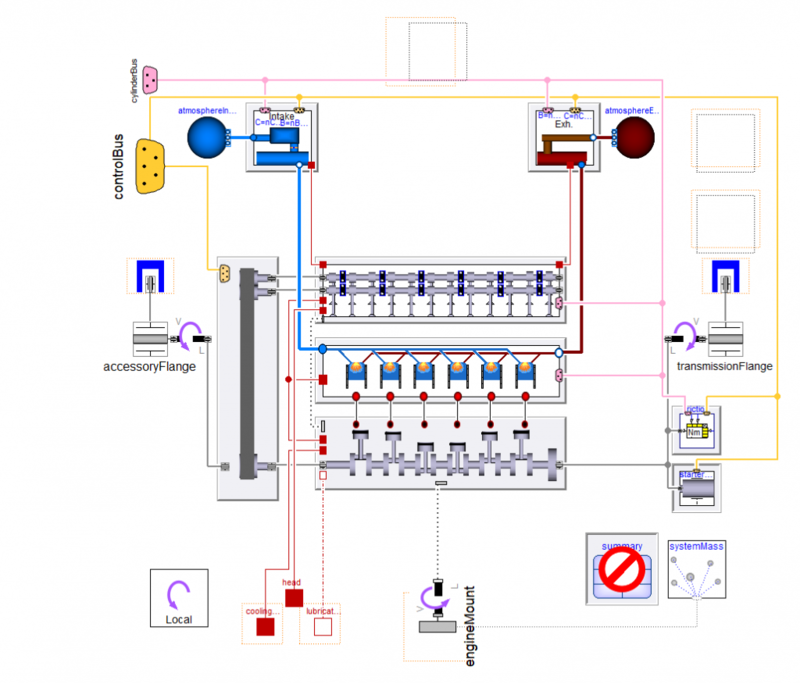 The key purpose of this library is to demonstrate the coupling of multiple automotive Modelica libraries together in a vehicle model. By combining libraries focused on modelling different automotive systems, you can create vehicle models with the correct level of fidelity for the application and type of analysis you are performing. In this blog post I will give you an overview of the vehicle models included in the library and the tests they are used in. 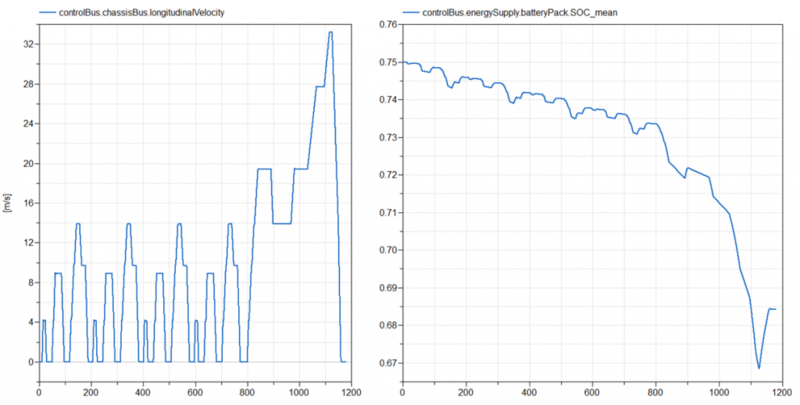 The purpose of RWDElectric vehicle model, Figure 2, is to perform energy analysis of a battery electric vehicle. This requires a vehicle with an electric drive, battery pack and motor controller but the other vehicle systems can be idealised. This was achieved by combining components from the VeSyMA and Electrified Powertrains libraries. The components from the Electrified Powertrains library, highlighted in red in Figure 2, were integrated with the VeSyMA system interfaces to make them compatible with the VeSyMA CarElectric template. 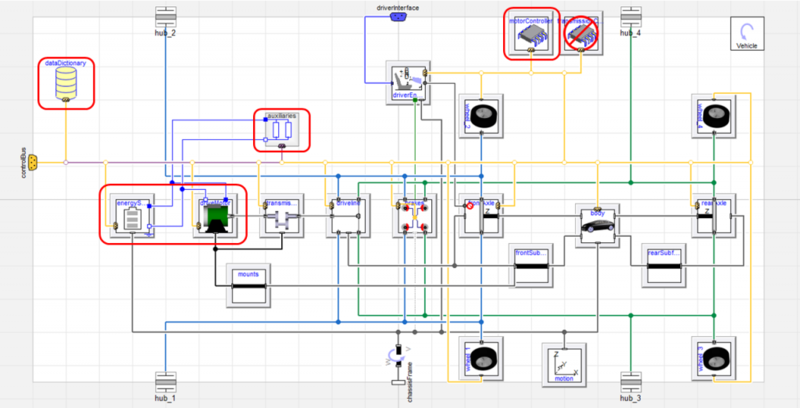 It was necessary to build a data dictionary to map signals on the control bus between the signal structures used by the VeSyMA and Electrified Powertrains models. 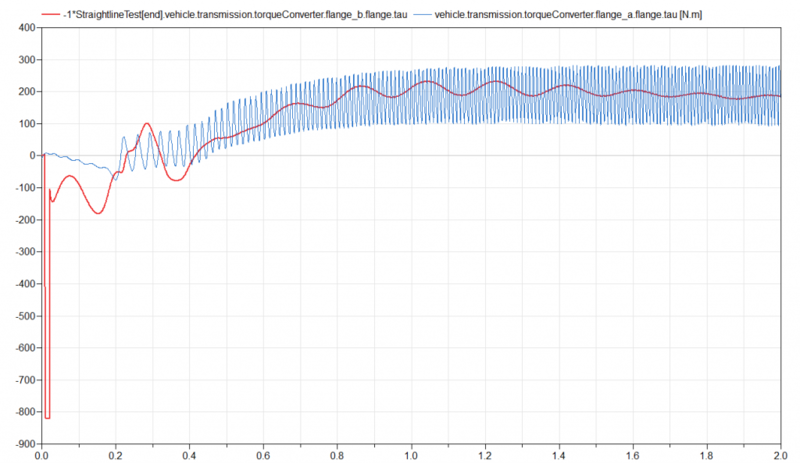 To perform an energy analysis, the RWDElectric vehicle was put through a New European Driving Cycle (NEDC) in the DriveCycleElectric experiment. 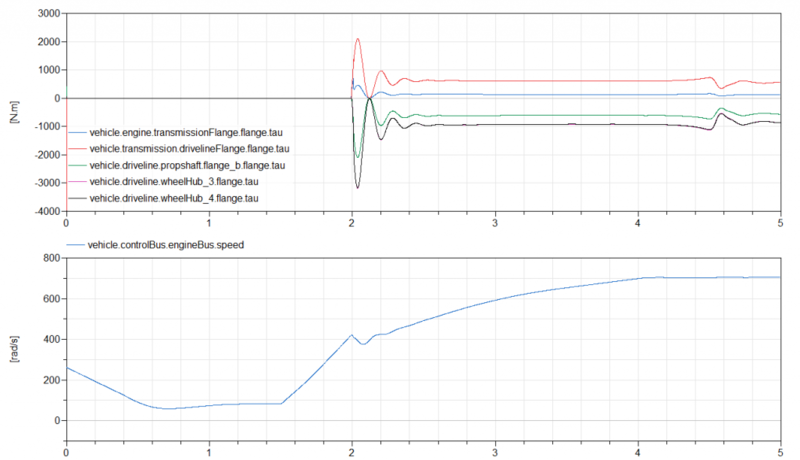 The idealised vehicle systems from VeSyMA allow the user to see generic metrics such as the vehicles longitudinal velocity. The Electrified Powertrains components allow the electric drive variables to be examined, like the mean state of charge of the battery during the drive cycle. The vehicles SmallFamilyMTHydraulicBrakes and LargeOffRoad4X4HybridATHydraulicDampers combine the VeSyMA, VeSyMA – Suspensions and Fluid Power libraries to build multibody vehicles with hydraulic component models. The SmallFamilyMTHydraulicBrakes vehicle is for dynamic vehicle manoeuvre tests of the hydraulic brake system. To do this the vehicle needs to have hydraulic brake components (brake caliper pistons, master cylinder and brake lines), multibody suspension with an idealised engine, transmission and driveline. The Fluid Power hydraulic models were incorporated into the VeSyMA FourWheelBrakes template to slot into the VeSyMA vehicle template. This vehicle is used to perform a split mue braking test, as shown in the animation below. The LargeOffRoad4X4HybridATHydraulicDampers vehicle is for dynamic vehicle manoeuvre testing of the hydraulic dampers. For this the vehicle requires hydraulic damper components and multibody suspension, accompanied by a simple hybrid powertrain in this case. To build the hydraulic damper model, Fluid Power components were assembled in a damper interface compatible with the VeSyMA – Suspensions DamperStrutMultiBody component. This vehicle was used to perform a double lane change test to examine the behaviour of the hydraulic dampers, including pressure, temperature, mass flow and enthalpy rates of the hydraulic fluid in the chambers of the dampers. The RWDCarAT vehicle was created to permit the transmission of vibration from the engine to gearbox via a dynamic torque converter to be examined. In order to be able to model these effects required a vehicle with a crank angle resolved engine model (CAREM) and a multibody transmission; this was achieved using models from VeSyMA – Engines, VeSyMA – Powertrain, VeSyMA and VeSyMA – Suspensions. 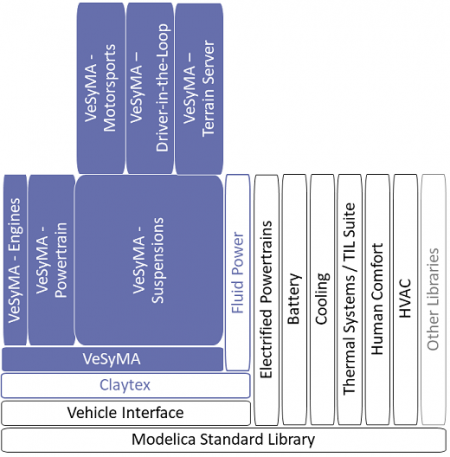 Models are compatible across the VeSyMA platform so the systems models from these different libraries could be plugged straight in to the VeSyMA vehicle template together. To demonstrate the damping effect of the dynamic torque converter in reducing the vibration transferred from the engine to the gearset, the RWDCarAT vehicle was used in a straightline test. The torsional vibration in the input and output flanges of the torque converter from this experiment are shown in Figure 6, clearly illustrating the damping effect of the torque converter. The detailed combustion model in the CAREM causes the simulation to be relatively slow; the surrogate version was used to improve simulation time, where key variables calculated in cylinder_1 are distributed to the remaining engine cylinders. The final vehicle in the Vehicle Demos library is the RWDCarAT model. Its purpose is to allow the forces and torques experienced in the engine, transmission and driveline during a highly aggressive pull away to be analysed for potential component failures. In order to perform this kind of analysis the vehicle needed to have a multibody, torsionally compliant driveline and elastic mounts; which was achieved using the VeSyMA, VeSyMA – Engines and VeSyMA – Powertrain libraries. This type of analysis did not require a CAREM, so a Mean Value Engine Model (MVEM) was used from VeSyMA – Engines; this is still a multibody model but simulation performance is vastly increased over a CAREM. In the Vehicle Demos IdiotStart experiment the RWDCarAT vehicle experiences a highly aggressive pull away, where the accelerator is fully depressed and the clutch released suddenly when the engine reaches peak torque. This means the peak forces and torques in the powertrain components can be determined during this scenario. Hopefully this post has given you a better idea of the joint capability of the Modelica automotive libraries available in Dymola. The Vehicle Demos Library will continue to be developed to include further examples of the automotive libraries from Figure 1 being coupled together. To take a look at the Vehicle Demos library for yourself, go to the File > Demos menu in Dymola; you will require a license for the commercial libraries used.